Racial Justice Act. SB 306 also seeks to end North Carolina’s defacto moratorium on the death penalty. 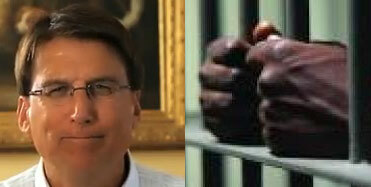 Governor McCrory said in a statement the implementation of the RJA was “seriously flawed”. But since the RJA was enacted, four death-row inmates have been resentenced to life in prison after a judge found that racial discrimination did indeed play a key role in their sentences. Previous PostMcCrory education advisor Eric Guckian calls for “aggressive charter school environment” in North CarolinaNext Post Pope groups turning to intimidation tactics? This governor is quickly becoming one of the most destructive and dangerous politicians of NC….and there are many to compete with, unfortunately. What a backwards thinking, pandering man. I only hope his behavior leads to an overwhelming shift in NC voters that even surpasses the impact of all of the right wing redistricting. A shameful rollback to the Jim Crow era. Have these people no shame or decency? OK, so if this Act is flawed; that means McCrory agrees with the idea of the Act but had problems with certain elements of it as is. In other words, he accepts the premise that the Act is needed but what we had was flawed. Soooo what are you going to replace it with, hmm?